R. W. Allen Crocker, M.
W. Job Drew, S. W.
W. Jonathan Whitney, J. W.
As one of the three lodges in this District whose Charters were issued previous to the Revolution, it has seemed proper that some formal notice should be taken of the fact that to-day completes the first centennial of an event which resulted in the ultimate independence of the United States; and the fact that the charter of the Massachusetts Lodge was signed by General Joseph Warren is a sufficient excuse, if any is necessary, to warrant us in recalling so important an event in our history. One hundred years ago to-day the Massachusetts Lodge had been in existence nearly five years. It numbered among its members some of the most active and noted men of the town of Boston. The Lodge was small, comprising at that time thirty members, the membership Being limited by the By-Laws to fifty. From its formation until 1775, the Lodge had held seventy meetings, the regular place of meeting being at Concert Hall, on the corner of Court and Hanover streets. On the evening of December 5, 1774, it was "voted that the removal of this Lodge to the Bunch of Grapes Tavern be notified in the public prints." The meetings of January 2d and February 6th were all that were held there for three years. At the meeting of February 6th, two candidates were crafted; it does not appear by the records that they were ever raised. Concert Hall is said to have been the most elegant hall in the town; the architecture of the inside was imposing, and the walls were covered with mirrors. Within its walls our predecessors gathered for several years; the meetings were well attended, and the "symposia" were as regular as the meetings; "sherry" and "punch" were the standard liquids, and the frequent appropriations for "mason glasses," to be imported from London, prove their con. stant use. The records contain a list of the visiting Brethren, among whom appears the name of Paul Revere. The Most Worshipful Joseph Warren constituted the Lodge August 10, 1770, and visited the Lodge in ample form, as the record states, on the 1st of April, 1771, July 6, September 7, and December 7, 1772. "December 28th," the record reads, "being ye Festival of St. John the Evangelist, the Most Worshipful Grand Master, Joseph Warren, Esq., Deputy Grand Master Joseph Webb, and Grand Wardens Samuel Danforth and Samuel Barrett, visited the Lodge in due form." This proved to be the last visitation the Lodge was to receive from their illustrious Grand Master. The important events transpiring in their midst, soon to culminate in war, prevented the usual meetings; the gun fired at Concord was not only to usher in a revolution, but was destined to make discord through all strata of society; the time had come when friends and neighbors were to part, and among the Brethren of the Massachusetts Lodge there was to be a lifelong separation. The last meeting of the Lodge previous to the Revolution was held on the 6th of February, 1775. John Jeffries, then a noted surgeon, was Worshipful Master; Hawes Hatch, Junior Warden; William Codner, Treasurer; John Fenno, Secretary. The names of Brethren of the Massachusetts Lodge appear prominently on both sides of the conflict—some fighting for the liberty of the colonies, others, equally conscientious, for the Mother country. William Palfrey (whose descendants for three generations have been honored members of our Lodge), Secretary of the Grand Lodge in 1769-70-71, the first Senior Warden of the Massachusetts Lodge, and W. M. in 1771 and 1779, was, during the war, Paymaster-General of the American forces. He was sent on special business to France by order of the Continental Congress; he sailed from Philadelphia in a public-armed vessel, which is supposed to have foundered at sea in the autumn of 1780. Nathaniel Cudworth was the first Treasurer of the Lodge, serving in that capacity in 1770-1; was elected Secretary in 1772; at the meeting May 4, 1772, he resigned. As he was about to take up his residence in the country, the Lodge tendered him a vote of thanks and the hospitalities of the Lodge whenever he should be in town. He commanded the Sudbury company in the battle at Concord, and "near Hardy's Hill attacked the British troops, where there was a severe skirmish." At the battle of Bunker Hill, he was a Major in Jonathan Brewer's regiment, composed of Worcester and Middlesex troops, "and did excellent duty in the battle." Joshua Loring was a loyalist, and held the office of Town Major under General Gage. At the evacuation of Boston in March, 1776, he left Boston, and is not known to have returned. Dr. John Jeffries, Worshipful Master in 1775, was a surgeon of a ship-of-the-line lying in Boston harbor in 1771 to 1774. At the battle of Bunker Hill, he attended the wounded by order of the British Commander. He accompanied the British garrison to Halifax in 1776, where he was appointed Surgeon-General of the forces in Nova Scotia. He afterwards went to London, where he practised in 1790 ; he returned to his native city, where he died in 1819. Hawes Hatch was a loyalist, and at the evacuation went to St. John, New Brunswick, where he settled, receiving a grant from the British government. He was elected Senior Deacon of the Lodge in 1774. Many years ago a young law student of our country opened a correspondence with Thomas Carlyle, the vigorous English writer. In one of his letters Carlyle said to him: "In your reading you will have to choose by what of manfulness and faithfulness is in your own mind, the better and the good, from out of the boundless imbroglio of the trivial: and with your whole soul, to appropriate these, and elaborate them as you have faculty and opportunity. Read history and prophecy; whatsoever of truly interesting has been, is, and is about to be. This same advice has been constantly in my mind as I have read the pages of these one hundred and fifty years of Massachusetts Lodge. Deeply realizing the significance of this hour, the constant effort has been to choose the better and the good from out of the trivial, because of its intrinsic value as history, yet more for its prophecy of the good to come as fruit from seed sown in faith. In so far as the limits of the hour permit, I offer you the results of this study. The seventeenth and eighteenth centuries were an epoch of political revolutions in the Anglo-Saxon world. The Pilgrim and Puritan movements reached their climax in the early years of the seventeenth century, and out of them came the beginnings of the Commonwealth of Massachusetts, from which this Lodge derives its name. In the year of which this is the three hundredth in anniversary, the ship Mayflower sailed into the harbor of Provincetown after a taxing voyage of more than two months on the stormy Atlantic. Before its passengers came ashore, and occasioned partly by discontented and mutinous speeches that some of the strangers amongst them had let fall, namely "That when they came ashore they would use their own libertie; for none had power to command them, a compact was drawn up in the cabin of the Mayflower. It said: "In ye name of God, Amen. We whose names are underwritten, having undertaken for ye glory of God and advancement of the Christian faith a voyage to plant ye first colony doe covenant-and-combine-ourselves-together, into a civil-body-politic, and by virtue hereof enact, constitute and frame such just and equal laws, ordinances, acts, constitutions and offices from time to time, as shall be thought must mete for ye general good of ye Colonie; unto which we promise all due submission and obedience." This historic document we now recognize as the beginning of government in Massachusetts, the basis of our civic progress through these succeeding centuries. One hundred and fifty years after the landing of the Pilgrims at Plymouth this Lodge, named after the State, was constituted. Its founders placed in the East a letter symbolizing the name of God; they lighted it up that it might be typical of the glory of the Great Artificer of the Universe; they placed upon the altar the text book of the Christian faith, the great light in Masonry; they framed just laws and constitutions, and created offices for the general good of the Craft; and they pledged themselves by the most binding of obligations to submission and obedience unto those laws and constitutions. The parallelism between the elements of the civic compact of the Mayflower and the foundations upon which the Lodge was built are marked with great significance, and the history of the Lodge is interwoven with that of the Commonwealth as warp with woof. This Lodge came into existence at a critical hour in the life of the Massachusetts Colony. George the Third was king of England, and America was a British Colony. The king's ideas of policy were those of a parental government administered with a stern face, a heavy hand, and an un-spared rod. Acts of trade, laws oppressive and repressive had roused the colonists to the utmost of resentment. In consequence, a provisional government looking towards independence had been formed in Massachusetts, under a so-called "Committee of Safety." Its objective was to assert and maintain opposition to the oppressive measures of the crown. The head of this committee was Dr. Joseph Warren. He was also the Grand Master of the Masons in Massachusetts. On the eleventh day of May, 1770, thirty-six days after the Boston Massacre, a petition was offered to the Grand Lodge, meeting at the Green Dragon Tavern — the trysting-place alike of the Masons and patriots of the day — praying that the eight men whose names were appended might be erected into a new Lodge under the name The Massachusetts Lodge." The next day, Saturday the twelfth, a Charter was made out by William Palfrey, who was one of the petitioners and also Secretary of the Grand Lodge. It was signed by Joseph Warren, Grand Master, and the Lodge was Constituted on Friday, August tenth, 1770, with Joseph Tyler as Master. Its Senior Warden was William Palfrey. This William Palfrey was Paymaster General of the American forces in the Revolution which was in the making when the Lodge was formed. This fact is typical of the life-story of Massachusetts Lodge. Its men have been makers in the commonwealth and in the city which is its capital. Not more so, perhaps, than those of some other Lodges; for it is our joy and pride that Masons have been the valiant leaders in our whole nation. Only for us today the significance of our celebration lies in the achievements of those who have been and are members of this particular body. When later the union of states was in peril, and those liberties which the Revolution had dearly won were in jeopardy, our state was again in the vanguard of leadership; and when the Civil War actually came a Massachusetts Lodge man stepped early into prominence. One Robert Cowdin had come to Boston from Vermont as a merchant. He became deeply interested in the Volunteer Militia of this state, and was one of the first to offer his services to Governor Andrew. The Second Regiment, Massachusetts Volunteer Militia, of which he was Colonel, was accepted by the Governor and became the first regiment of volunteers taken into the United States service for the Rebellion. During this war, an Army Lodge was established in the Forty-third Massachusetts Regiment, known as the Tigers. It was called McClellan Lodge. Its first Master was one Thomas G. Whytol who was Master of our Lodge in 1854, 1855, and 1860. There we see again how Masonry and public service were walking hand in hand. In our last war, when the liberties of all the world were in the balance, Massachusetts men added themselves to the radiant host of defenders and victors. The Honor Roll records the names of many war officers and privates, not to mention the great number kept from military service by the limits of age who in civil life gave freely of their service and their money to the great cause. "The soul of history," Carlyle said, "is the history of great men. The really great man is the living light-fountain. The light which has enlightened the darkness of the world; a flowing light fountain of native insight, of manhood, and heroic nobleness, in whose radiance all Souls feel that it is well with them." Recognizing the limitations of bringing within a half hour the story of one hundred and fifty years, and yet wishing to make bright some thread in the life fabric of the Lodge, I ask you to walk with certain of our great men as they have woven the continuing life both of Lodge, city, and commonwealth, ever bearing in mind the principles, already enunciated, which underly Massachusetts the State and Massachusetts the Lodge. Izaak Walton in the Compleat Angler quotes from a certain Boteler about strawberries. He says, "Doubtless God could have made a better berry, but doubtless he never did." Doubtless too he might have made a better man than a good Scotchman, but one doubts if he ever did. So here is William Scollay, who received his degrees in 1779. He was out of Scotch stock. The father, one John by name, was in Boston as early as 1692, for he appears in Drake's History as the man who for seven years leased the Winnisimmet Ferry. To one born as was the writer in Old Chelsea and nourished in the traditions of Rumney Marsh, Winnisimmet, and Powder Horn Hill, that leasing is really an interesting fact. At any rate the son, William, was important man enough to have his portrait painted by the great Copley and his merit lies largely in the vision he had of the possible development of Boston. He lived in a house on or near where the old Boston Museum stood, that orthodox theatre where the inheritor of the blue laws made his first conscientious venture into modern amusements under the joyous guidance of William Warren and Mrs. Vincent of blessed memory. With Charles Bulfinch and other prominent men Mr. Scollay undertook the improvement of Franklin Place, now Franklin Street. From this he passed to the development of South Boston, strenuously advocating the building of the Federal Street Bridge, and later he purchased for improvement the Dorchester Heights. We look to him also as the father of a young woman who married Col. Thomas Melville, one of the Boston Tea Party, an enterprise, by the way, wholly Masonic, brewed in the Green Dragon Tavern. When the Colonel returned home from this merry venture he emptied his shoes of some of the historic tea, which now rests in a sacred bottle in the Antiquarian Society at Worcester. In this connection one is happy to mention Moses Michael Hays as a type of those who have done so much for the financial prosperity of the city and the state. He is worthy of notable Masonic mention as Master of our Lodge, also as Junior Grand Warden, and later Grand Master of Masons in Massachusetts, and as a constant benefactor of this Lodge in its varied sufferings by fire. One does not forget either the later relations of Massachusetts to the present Shawmut Lodge, composed so largely of men kindred in race with Moses Michael Hays; a new and brilliant star in the canopy of Masonry, named, rather significantly, after the Boston peninsular of colonial days. Boston has long been famous as a pioneer city in the furtherance of musical culture and education. One interesting element in it is that some of its significant patronage has been that of business men. We recall the Boston Opera House fostered by Mr. Jordan, and the Symphony Orchestra made possible by the generosity of Mr. Higginson. As early as 1779 one Matthew Stanley Parker opened his eyes at Wolfeboro, New Hampshire. He was the grandson of the Honorable William Parker of Portsmouth who, previous to 1765, for some years was the only Notary Public in the Province. Matthew held various offices in our Lodge during the Anti-Masonic assaults of 1826 to 1836, and was in his own personal character an able defense against this misunderstanding. He was the Cashier of the Suffolk Bank, and devoted something of his leisure and means to the origination and formation, in company with a few choice spirits, of the now historic Handel and Haydn Society, to whose fidelity we owe the yearly production of the great oratorios and which has been the progenitor of many choral organizations throughout the state. Will you turn now to that which has made Massachusetts as a State the foremost in the Union; namely, popular education. From its elementary branches through the most advanced university training we have been leaders. The school and college owe their early fostering to the church. Harvard, Amherst, Williams, Smith, Wellesley, Mount Holyoke, found their origin and support in men and women trained to value the great light of Masonry, the Holy Scriptures. To them knowledge was light indispensable to morality and the formation of true character. Massachusetts Lodge recalls two notable men of the earlier day. There is the Rev. John Prince, LL. D. Born in the north part of our city, he was educated at the Boston Latin School and at Harvard College and was the strong minister of a Salem church for nearly fifty-eight years. This church overshadowed a house in which soma of the hours . of my childhood were passed, the home of my great-grandfather, also a Revolutionary general, and later this ho\ise was one of the underground stations of Civil War days, where refugee slaves were secreted by day and driven at night to the next station on their way to freedom. In addition to the study of theology Mr. Prince found time for scientific investigation and gave to the commonwealth and to the world some notable inventions. Then there is one of traditionally famous name in the American educational world, the Rev. John Eliot, D. D., also a graduate of Harvard and for thirty-four years minister of the New North Church here in Boston. He stands with the Rev. J. Belknap, D. D., as founder of the Massachusetts Historical Society, and he assisted largely in forming its collection of valuable documents. In this connection one must not forget the Hon. John Lowell, educated at the Latin School, Phillips Academy, Andover, and Harvard College, who stands forth as one of the founders of the Boston Athenaeum, and also the Massachusetts General Hospital. With these men one associates the Hon. John Prescott Bigelow, also a graduate of Harvard, Mayor of Boston in 1849, 1850, and 1851. During the cholera epidemic in the city and as a reward for efficiency in its suppression the citizens proposed to present him with a silver vase of the value of one thousand dollars. In declining the gift, he suggested that the money be used as a nucleus for a subscription to found a free library. This was the origin of our present Public Library which stands in Copley Square with its literary and artistic treasures, memorial through Mr. Bigelow to Massachusetts Lodge. Suggested by the founding of the Massachusetts General Hospital, we are reminded of the members of the Lodge who have made notable contribution to the medical life of our city and commonwealth. Joseph Warren, who signed our charter as the Grand Master, was a physician of great promise. John Warren, his brother, was a student under Joseph. John also became Grand Master of Masons in Massachusetts June 24, 1783, and was present on the 5th of March, 1792, when the union between the Massachusetts and Saint John's Grand Lodge took place. During the Siege of Boston he was appointed surgeon by General Washington. Later he filled the chair of Surgery and Anatomy in Harvard College for thirty and more years; and was the distinguished president of the Massachusetts Medical Society. Then there are Aaron Dexter and Isaac Rand, the former Erving Professor of Materia Medica at Harvard, also Grand Treasurer and Junior Grand Warden respectively of the Grand Lodge; the latter a physician of eminence in Boston and for six years president of the Massachusetts Medical Society and a member of the American Academy of Sciences. Turning now to the development of our public life through the legislative and administrative branches of government we are in a field of significant service rendered by the members of Massachusetts Lodge. William Palfrey who signed the Charter as Secretary of the Grand Lodge, and who was also a charter member of this Lodge, served during the formative days of our Republic as Paymaster General of the American Revolutionary Forces. Later he was sent by the Continental Congress in an armed vessel on special government business to Prance. Unfortunately the ship, foundering at sea, cut short a usefulness of rare promise. He left, in succession, a noble helper in the person of Hon. Perez Morton. Morton was a graduate of the Latin School and of Harvard and a classmate of Dr. John Warren. He added to membership with us the office of Deputy Grand Master in the Grand Lodge, and also that of Senior Grand Warden for two years. A fellow member with Warren of the Committee of Safety, he became Speaker of the Massachusetts House, holding for five years. He was also a delegate to the convention for revising the State Constitution, and was Attorney General in Massachusetts for twenty-two years. The Hon. Thomas Dawes held in succession office in the Supreme Judicial Court of the state, the Municipal Court of Boston, and the Probate Court for Suffolk County. He was also one of those who revised the State Constitution in 1820. William King finds distinction Masonically as the first Master of Solar Lodge of Bath, Maine, chartered by the Grand Lodge of Massachusetts, and by his election as the first Grand Master of Masons in Maine, when that body became independent. A member of the Massachusetts Legislature for three years, and a Senator for an equal period, he was chosen President of the convention to form the constitution of Maine, and was elected the first Governor of that state, which office he resigned to become United States Commissioner under the Treaty with Spain. Among these worthies of the older day stands out the Hon. Christopher Gore, lie was appointed by President Washington the first United States District Attorney for Massachusetts. This was followed by his election as one of the Commissioners to settle the claims of the United States upon Great Britain for "spoliation." Later he was made Governor of Massachusetts and subsequently served as United States Senator for three years. One other name deserves honorable mention, twice elected as Master of Massachusetts Lodge and Deputy Grand Master of the Grand Lodge, the Hon. Edwin Wright. Valedictorian of his class at Yale College, he became Master of the Eliot School of Boston. He then studied law, and after admission to the Suffolk Bar rose to the first rank in the department of Testamentary and Realty Law. He was twice a member of the State Legislature and in 1861 was appointed by Governor Andrew one of three Justices of the Municipal and Civil Court of Boston. And what shall I say more ? For the time would fail me to tell of Dame and Dexter, of Oliver and Boyle, of Laughton and Jackson, all officers of distinction in the Grand Lodge. Of Captain Williams, Colonel Gardner, Major Henry, and Captain DeBaury, famous in battle. Of Calef, founder of our charity fund; of Haskel, the princely merchant, and Bowen, historian of old Boston; of Slack, the Masonic orator; of Rowsen, trumpeter in the Kings Guards, who changed his piping from "God Save the King" to "Merry Yankee-Doodle"; of the family of the Clapps, treasurers of the Lodge for decades. Surely it would be unbecoming to discriminate among the living, great as are their merits, and though the profit of such speaking would be deserved and very delightful. Something, however, must be left to the imagination and to memory. All along the line of the years the men are many who have contributed their money, their time, their loveful service to further the interests of this Lodge. Some have attained to high distinction in office not alone in the Massachusetts and the Grand Lodges but in other Masonic bodies. Some have given their lives in battle for the nation and the world; some have served in major and minor places the causes of state and nation. Many others, uncounted in the rank and file, have kept and interpreted the Masonic faith in the varied walks of civic, commercial, and religions life. Some have passed to the Celestial Lodge, many, greater and lesser, still abide, to carry forward the work, the beautiful Masonic work, and to translate its noble truths into the life of city and state and nation. If it shall please the Lodge so to do, a volume will be prepared supplementing those already in our archives, giving due place and honor to the whole membership, a thing manifestly impossible in the limits of this hour and this occasion. And there is something to tell with a meaning." "The unseen mysterious, ruling passion weaving the stuff of human nature into patterns wherein the soul is imaged and revealed." This is true of an institution as well as of a single life. Masonry has a soul, and the story of the years of an individual Lodge which has been true to historic Masonry as a whole, cannot have failed to image and reveal that soul. I hope you have felt this as you have walked with these men of the past. If you have, then surely you have realized that however much the outward forms of our existence change the vital soul goes steadily on its God-appointed way, transfusing the new conditions with its spirit, and not less but more as it gathers up all the wisdom of experience, and as it realizes the value of the tasks set before it by the enlarging opportunities of the new day. And it is a new day in the world. Life has gained tremendously in its extensive and intensive visions. The little Boston of 1770 has become a great city; the intellectual culture of Massachusetts has been a seed out of which a vast deal of our American education has grown, adding to classic learning the many branches incident to technical and scientific progress. The democracy hidden within the colonial government has been a leaven working world-wide; first upsetting and then reconstructing agelong dynasties. The light of religious and moral obligations set in its candlestick at Plymouth three hundred years ago has shined into the darkest places of the whole round world. Meanwhile the fellowships of Masonry have tied together men of every nation, race, and creed not alone through the American continent but eastward also among the forbidding peoples of the Orient. One wishes that Governor Bradford and Joseph Warren and other valiant men of the early days could stand again upon our earthly soil and see how their labors have been fulfilled. They would indeed rejoice and give praise to the God whose servants they were in Lodge and state. As soon as Fate hath wings. Up our lives, all to piece one giant day." "Lord, give me an ideal that will stand the strain of weaving into human stuff on the loom of the real. Steady me to do my full stint of work as well as I can, and when that is done, stop me, pay what wages thou wilt, and help me to say, from a quiet heart a grateful Amen." In this spirit I close this all too inadequate story of our Lodge and the one hundred and fifty years of its labors. The ideal in my own mind has been clearer perhaps than appears in the woven fabric. None the less the human stuff has been very real, and as I have lived with it now these many years, foreseeing this gracious day and hour, I have felt the glory of that composite life which has been making an historic sequence through the changing periods: a history both of men and of ideas, and of ideals, with a god's mind forming the pattern, and informing the worker, and the hand of the supreme Maker of the whole universe directing its outweaving. So too, for the privileges of this study and its message to you today I would fain say, "A grateful Amen. By Rt. Wor. John Wentworth. Unlike the beginnings of Freemasonry, which are shrouded in the mystery of ages long past, the origin of The Massachusetts Lodge is largely a matter of record. In 1770, when our Lodge had its origin, two Grand Lodges existed in Massachusetts as well as in England. The earlier, known as Saint John's Grand Lodge, which corresponded with the so-called "Moderns" in England, had been organized in 1733 by Henry Price by virtue of a commission granted by the Grand Master of the Free and Accepted Masons of England, appointing Henry Price Provincial Grand Master of New England. The later Grand Lodge, known as Massachusetts Grand Lodge, corresponding to the so-called "Ancients," was organized on December 27, 1769. Its Grand Master was Most Worshipful Joseph Warren, who had been, appointed Grand Master in Boston and within one hundred miles circumjacent to the same by Patent from the Grand Master of Scotland. Our Lodge was brought into being by virtue of a charter dated and signed by Joseph Warren, Grand Master, and his Grand Wardens. There are several respects in which the creation and constitution of this Lodge differed from present day practice. Nowadays, when a new Lodge is about to be formed, the Grand Master issues a dispensation authorizing certain Brethren named to organize and act as a Lodge. After a time, if the acts of the members and officers of the Lodge under dispensation are satisfactory, a charter is granted by vote of the Grand Lodge and the new Lodge is formally and ceremoniously constituted. It was not thus that The Massachusetts Lodge was formed and constituted. There was no preliminary period during which oar Lodge acted under dispensation, nor was it constituted or chartered by the Grand Lodge. The creation, charter and constitution of our Lodge was the act solely of the Grand Master, Joseph Warren, and his Grand Wardens. It appears that on Friday evening, May 11, 1770, at a meeting of the Massachusetts Grand Lodge, a petition of Brothers Joseph Tyler, William Palfrey, James Jackson, John Hill, John Jeffries, Nathaniel Cudworth, Isaac Rand and Joshua Loring praying that they might be erected into a new Lodge to be held in Boston under the title of The Massachusetts Lodge, was read. At that meeting, the Grand Lodge took no action on the petition except to vote that the petition be deferred until the following Monday. In the meantime, on the very next day, on Saturday, May 12, 1770, the charter of The Massachusetts Lodge was made out, dated and signed by the Grand Master, Joseph Warren, and the Grand Wardens. Prior to that date, no vote had been adopted by the Grand Lodge authorizing the charter or constitution of The Massachusetts Lodge. While the petition had been presented to the Grand Lodge the previous day, the only vote by the Grand Lodge touching the matter had been a vote to defer the petition. On the following Monday, May 14, 1770, the Grand Lodge again met and the petition was again read, but before action thereon was taken, it was voted that the commission of the Grand Master be read, there apparently being some difference of opinion concerning the powers of the Grand Master. After debate, the question was put whether the prayer should be granted. Eight voted in favor and four against. The Grand Master permitted the vote to be taken, but did not himself vote, perhaps because by voting he might be considered as recognizing the right of the Grand Lodge to vote upon the question. The charter, however, was not changed nor was any certificate of the vote added thereto. In form and date the charter remained and still remains, not as the act of the Grand Lodge, but as the sole act of the Grand Master and his Grand Wardens, as it, in form, purports to be. It recites that the petition for the new Lodge had been presented to "us" (that is the Grand Master and Grand Wardens) and "We, the said Grand Master and Wardens, by virtue of the power and authority aforesaid (that is, the Patent from the Grand Master of Scotland) have constituted and appointed and by these Presents do constitute and appoint them (the Brethren named in the petition) a regular Lodge of Free and Accepted Masons, under the name, title, and designation of The Massachusetts Lodge." No mention of the Grand Lodge appears in the charter except the obligation to attend the Grand Lodge and lay the record of their proceedings before the Grand Lodge when required, and the further statement that the seal of the Grand Lodge is affixed and the certificate of the Grand Secretary thereon that the charter has been recorded in the Book of the Grand Lodge. The vote of the Grand Lodge on May 14, 1770, was undoubtedly a ratification of the charter, but our Lodge exists by virtue of the act of the Grand Master and the Grand Wardens on May 12, 1770. This was not the only respect in which the creation of The Massachusetts Lodge differed from the creation of new Lodges at the present time. There was no period during which our Lodge acted under dispensation. There was no formal "constitution" of our Lodge in the sense in which that word is used today, and the installation of the officers of the Lodge, ^hich has sometimes been referred to as the "constitution," was hardly more than an installation of officers within the body of the Grand Lodge. Jeremiah Webb, who was not at that time a member, was appointed Steward, and Moses Pitcher, who was not a member, was appointed Tyler. The Lodge voted that James Jackson, who had been chosen Junior Warden, represent the Lodge as Senior Warden, and John Hill, who had been chosen Senior Deacon, represent the Lodge as Junior Warden at the Grand Lodge, perhaps because William Palfrey, the Senior Warden of the Lodge, was also the Grand Secretary of the Grand Lodge. A committee was chosen to draw By-Laws and it was voted to meet the first Monday in every month. The record does not state where this meeting was held, but it was probably held in the Green Dragon Tavern on what is now Union Street, a building then owned by The Lodge of Saint Andrew, of which all of our charter members, as well as the Grand Master, Joseph Warren, were members. The Lodge of Saint Andrew is truly our Mother Lodge, of which fact we can only be most proud. The second meeting was held on Monday, June 4, 1770, also at the Green Dragon Tavern. It was voted that the thanks of the Lodge be given to Brother John Hill for his generous present of a "curious" apron for the Master of the Lodge and his successors. The Lodge next met at Concert Hall on June 11, 1770, at which meeting Samuel Gardner and John Langdon, Jr., were proposed and made Masons and members of the Lodge, although they had not then received the second or third degrees, it apparently being the custom at that time and for a long time thereafter for Brethren to become members when or after they were made Masons without requiring them to wait until they had received the second and third degrees. The Lodge met again on July 3, 1770, at Concert Hall, at which meeting Francis Shaw was proposed and made a Mason and a member. The next meeting was on August 6, 1770, at Concert Hall. At this meeting it was voted that "the Installment of this Lodge be on next Fryday night Week" and a committee was chosen to prepare "necessarys" for the installation. On August 10, 1770, the Lodge met at Concert Hall by order of the Master. Four Brethren were raised Masters. The record of this meeting contains no reference to the "Installment" of the Lodge, but on the same day, in the same Hall, a meeting of the Grand Lodge was held at which were present the Brethren of The Massachusetts Lodge. Brother Joseph Tyler was called out by the Grand Master, and after being unanimously appointed by the Brethren of the Massachusetts Lodge, was, in due form, installed by the Grand Master and proclaimed "Right Worshipful Bro. Joseph Tyler, Master of The Massachusetts Lodge," after which the other officers were nominated and installed. From that time the Lodge, according to its records, proceeded in the usual way, holding meetings, accepting candidates, making, crafting and raising Masons, at times receiving the Grand Master, and making charitable contributions until and including February 6, 1775, when a meeting was held at the Bunch of Grapes Tavern, John Jeffries being then the Master. Two Brethren were crafted and a committee was chosen to wait on those members who had forfeited their membership by omitting to pay their quarterages to enquire of them whether they desire to be considered any longer as members of the Lodge. The record of that date discloses no hint of suspending the meetings. Apparently, however, no further meetings of the Lodge were held until December 9, 1778, a lapse of nearly four years. During that period the colonies were in the midst of the War of the Revolution. The distractions of the period suggest to they were in large measure the cause of no meetings of the Lodge being held. On February 6, 1775, John Jeffries was Master. In 1776 he accompanied the British Garrison to Halifax, went to England in 1779 and apparently did not return to Boston until 1790. His absence from Boston may well have been a contributing cause of the omission of meetings from February 6, 1775, to December 9, 1778. On the latter date the Lodge held a meeting at the Bunch of Grapes Tavern. William Palfrey, who was the only Past Master of the Lodge present, apparently acted as Master. The record of that meeting makes no mention of the omission of meetings since February 6, 1775. A Brother was admitted as a member and a committee was appointed to revise the By-Laws and officers were chosen, William Palfrey being chosen Master. It was voted "that the Worshipful Master and Wardens be desired to wait on the Right Worshipful Grand Master and inform him that The Massachusetts Lodge No. 2 have met and made choice of their officers and that they are ready to attend the Grand Lodge whenever proper summons shall be issued for that purpose." The Lodge adjourned until the following Monday evening, at which time a meeting by adjournment was held and six candidates were proposed. From that time on, for about seven years, regular meetings were held, business of the Lodge transacted, candidates accepted, made, crafted and raised. At a meeting held November 5, 1782, Brother Moses Michael Hays (afterwards Grand Master) was present as a visitor and was proposed as a member, balloted for and accepted. At the next meeting held December 3, 1782, Brother Hays was elected Master and he was re-elected Master on December 2, 1783, and on December 7, 1784. From June 6, 1785, until June 12, 1788, no meetings of the Lodge were held. This was probably due in large measure to the condition of the country and the exhaustion of the people by the War of the Revolution. It seems, however, the more noteworthy because Right Worshipful Brother Hays, who during this period was Master, was noted for his zeal and attachment to Masonry, and during a part, if not all of this period, was active in the Grand Lodge, holding the office of Junior Grand Warden in 1786. On June 6, 1788, this remarkable man, while holding office of Master of The Massachusetts Lodge, was chosen Grand Master. Six days later, on June 12, 1788, a meeting of The Massachusetts Lodge was held by his order as Master. At this meeting he "acquainted the Brethren that so much time had elapsed by neglect of the Lodge's Meeting that complaints were made by the Grand Lodge & Demands were made for their dues to the Grand Lodge therefore the R.W. Master called on the Lodge for their serious consideration when the members Voted & Resolved To Support the Honor & Dignity of the Lodge and that from this evening should commence their Resolutions." The record of this meeting further states that "The R. W. being (at the late meeting of Grand Lodge) nominated G. Master elect, this Lodge therefore proposed an Election of Officers for the present year," and William Scollay was elected Master and other officers were chosen and" installed. Regular meetings were resumed and have continued until the present time. The seal of the Lodge was adopted in 1772, the Lodge having no seal previously. It is believed to have been cut by Paul Revere. Bunker Hill Monument. On June 17, 1825, the Lodge met at Faneuil Hall at 8 a.m., and joined the procession to Charlestown under the direction of the Grand Lodge, where the corner stone of Bunker Hill Monument was laid by Most Worshipful John Abbott, Grand Master, assisted by General Lafayette and a number of officers of the Grand Encampment, Grand Royal Arch Chapter and Grand Lodges of neighboring states. On May 30, 1845, the Lodge voted to accept an invitation from King Solomon's Lodge of Charlestown to join it on the 24th of June in dedicating the Model of the Old Monument erected by them in 1794 to the memory of General Joseph Warren and his associates, which had been placed within the present monument, and also of holding a general Masonic celebration of that anniversary. In the latter part of 1826 an attack was made upon Freemasonry in the State of New York and anti-Masonic feeling soon spread over other parts of the country, including Massachusetts. It is not our purpose here or now to give an account of that anti-Masonic agitation. Suffice it to say that it continued for many years. It caused many members of our Lodges to absent themselves from Masonic meetings and to withdraw from their Lodges in such large numbers that many of our Lodges were induced to surrender their charters and go out of existence. »The Massachusetts Lodge, however, continued to hold meetings although at one time the number of their meetings was reduced to four per year. The Lodge continued its Masonic work though the number of members remaining active was greatly reduced. For a period of about twelve years, from 1829 to 1841, no additions to our membership were made, but the Lodge did not surrender its charter. The first two meetings of our Lodges were held in the Green Dragon Tavern. In June, 1770, the Lodge moved to Concert Hall, on Queen Street, now Court Street. From 1774 to early in 1775 and from December 9, 1778, to June 6, 1785, and from June 12, 1788, to September 14, 1789, the Lodge met in the Bunch of Grapes Tavern on King Street, now State Street. From October 12, 1789, to July 17, 1804, the Lodge met at Concert Hall, and from August 21, 1804, to July 16, 1805, and on December 29, 1806, at Vila's Hall near Concert Hall, and from July 29, 1805 (except on December 29, 1806) at Mason's Hall in a building opposite the north side of Faneuil Hall, and continued there until the summer of 1817. On July 25, 1817, the Lodge met at the then New Masonic Hall, in the Exchange Coffee House, situated between Congress and Devonshire Streets near State Street. The Lodge continued there until the Exchange Coffee House was destroyed by fire on November 3, 1818. The record of the meeting of November 27, 1818, states that the meeting was held at "Mason's Hall." As the Exchange Coffee House was destroyed earlier in the same month, it is not clear from the record where the meeting of November 27, 1818, was held. The next meeting was held on December 4,1818, at the Commercial Coffee House, at the corner of Milk and Batterymarch Streets. On December 25, 1818, the Lodge met at Masons' Hall on Ann Street. On December 17, 1819, the Lodge held a special meeting at Concert Hall, but on December 31, 1819, meetings were resumed at Masons' Hall on Ann Street and apparently continued to be held there until 1821. On October 27, 1820, a committee previously appointed to procure a place for the future meetings of the Lodge reported that they had agreed with the other Masonic Societies and had engaged to pay their proportion of the rent and repairs of the upper stories in the Old State House, the rent of the whole to be ?600 per year for the term of ten years. The Lodge met on March 30, 1821, for the first time in Masons' Hall in the Old State House and on April 13, 1821, held a special meeting there for the purpose of introducing the ladies into the newly fitted Masonic Hall. The Lodge continued to meet there until and including April 30, 1830. On July 30, 1830, the Lodge met at Masons' Hall on Washington Street opposite Franklin Street and apparently continued there until December 1831. On December 30, 1831, the Lodge met at the Masonic Temple, a granite structure erected by the Grand Lodge on the corner of Tremont Street and Temple Place, adjoining St. Paul's Church. In consequence of a sale of the Masonic Temple at the corner of Tremont Street and Temple Place, the Lodge in 1858 moved to the Masonic Apartments in Nassau Hall, on the corner of Washington and Common Streets, our first meeting there being on October 15, 1858. The Lodge remained there until January 16, 1860, when the Lodge held a meeting in Freemasons' Hall in the building known as the Winthrop House at the corner of Tremont and Boylston Streets. The Lodge continued to meet there until the building was destroyed by fire on April 5, 1864. Our Lodge, in common with other Lodges, suffered great loss by that fire. Our original charter, signed by the renowned Joseph Warren, was destroyed. On April 9, 1864, our Lodge met at Freemasons' Hall, South Boston, and on April 18, 1864, at Odd Fellows Hall, and on April 26, 1864, at Freemasons' Hall in the Thorndike Building on Summer Street. The Lodge continued to meet in the Thorn-dike Building until the erection of the New Masonic Temple at the corner of Tremont and Boylston Streets. On September 16, 1867, the Lodge met in the New Masonic Temple, and continued to meet there until the summer of 1895. A destructive fire there on September 7, 1895, necessitated our moving again. The next meeting was held on September 16,1895, in Masonic Hall, Roxbury, where the Lodge continued to meet until January 20, 1896, when the Lodge met in Sutton Hall, Masonic Temple, the building having been repaired in part. On February 17, 1896, the Lodge met in the New Masonic Apartments in the Boylston Building, 18 Boylston Street. This continued to be the meeting place until September 18, 1899, when the Lodge held its first meeting in this building, where it has continued to meet until the present time. The Lodge celebrated its 94th anniversary by appropriate ceremonies in 1864, its 95th in 1865, its 100th in 1870, its 112th in 1882, its 125th in 1895, its 145th in 1915, its 150th in 1920, at most if not all of which celebrations the history of the lodge was summarized and in some cases elaborately and instructively narrated. At the celebration of the 95th anniversary held on May 12, 1865, the copy of the charter which had been carefully prepared from the charter of The Tyrian Lodge of Gloucester, which had been chartered in 1770, shortly prior to the charter of our Lodge, was presented and examined by the Grand Master and others, who pronounced it well executed and hardly distinguishable from the original. In 1870 a Centennial Medal was adopted and authorized by a Centenary Warrant from the Grand Master, to be worn by the members in all Masonic meetings. Unfortunately, the custom of wearing this medal has in recent times not been followed. One of the powers enumerated in the charter of The Massachusetts Lodge is "to receive and collect funds for the relief of poor and decayed Brethren, their Widows or children." The Lodge began the practice of charity early in its history, and has continued it till the present. The first recorded reference to charity being disbursed by the Lodge occurs in the record of a meeting held February 4, 1771, when Brother James Connor, a visitor, presented a petition, and a committee was appointed to inquire into his circumstances and give him what they thought proper on account of the Lodge. At a meeting of the Lodge on March 4, 1771, the committee reported that on inquiry, they thought proper to give him eight dollars and it was voted that the same be paid by the Treasurer to Brother James Jackson, who advanced it. In the records of later meetings it frequently appears that various sums were donated to poor and distressed Brethren, usually visitors, sometimes from Lodge funds and sometimes from collections taken at the meetings. On April 30, 1810, the propriety and utility of instituting a fund for charity being suggested by one of the members, a committee was chosen to take it into consideration and report a plan by which such a fund might be established with success. On July 30, 1810s, the committee reported a plan, which after some alterations, was adopted. The plan was to take for that purpose three hundred dollars from the four hundred and fifty dollars then on hand, and each member to pay into the fund one dollar, one dollar to be taken from the money received for each initiation, and each newly admitted member to pay into the fund five dollars and all donations to the Lodge to be put into the fund, the income to be given to those persons whom the Lodge thought most deserving of charity. The charity fund still exists, though many changes have been made in its management. The dispensing of relief to our poor and distressed members, their widows and orphans, has ever since been, and still is, an important function of our Lodge and now is being administered under the careful and efficient direction of our Senior Past Master, Worshipful John R. Griffin. In addition to extending financial assistance to our poor and distressed members, their widows and orphans, the Lodge, beginning in December, 1927, has provided each year, to and including last December, a period of eighteen years, a Christmas Celebration at the Masonic Home in Charlton, and in recent years, at the Masonic Hospital in Shrewsbury, for the entertainment and pleasure of the residents of those Institutions. Since about 1929, the prosperity of the Lodge has diminished. Owing to the business depression and other causes, the Lodge has lost in membership and revenues have gone down. The members, however, have not given up hope that the future will be brighter. When we recall what hard times the Lodge has been through, yet still survives, we are not discouraged, but on the contrary, realize that if we will have even a small part of the faith, courage and enthusiasm of our members of former times, we may continue to practice our Masonic rites and to contribute to the good of mankind. Many matters of importance and interest in the history of our Lodge have been passed over in this sketch, not only because of lack of time in securing the data, but in order that the patience of the listeners might not be unduly taxed. Massachusetts Grand Lodge, Organized December 27, 1769, by authority of a Commission from Right Honorable and Most Worshipful George Earl of Dalhousie, Grand Master of Masons in Scotland, bearing date of May 30, 1769, appointed the Most Worshipful Joseph Warren, Esq., to be Provincial Grand Master of Masons in Boston, New England, and within One hundred Miles of the same. Friday, May 11, 1770. Eight members of St. Andrew's Lodge, Brothers Joseph Tyler, William Palfrey, James Jackson, Isaac Rand, John Hill, Nathaniel Cudworth, Joshua Loring and John Jeffries, petitioned the Massachusetts Grand Lodge to be erected into a new Lodge to be held in Boston under the title of "The Massachusetts Lodge." Saturday, May 12, 1770. The petition was granted, the Lodge INSTITUTED and the Charter signed by Joseph Warren, Grand Master; Jeremy French, S.G. Warden; Ponsonby Molesworth, J.G. Warden. Brothers Palfrey, Hill and Jeffries were appointed a committee to form By-Laws. The first Monday of each month was the time set for the regular meetings. Friday, August 10, 1770. At a communication of the Massachusetts Grand Lodge in Concert Hall, the Lodge was CONSTITUTED and Brother Joseph Tyler was installed by Joseph Warren, Grand Master, and proclaimed: "Right Worshipful Brother Joseph Tyler, Master of The Massachusetts Lodge." The Grand Secretary was ordered to make a record of that proceeding, after which the remaining officers were installed. The Massachusetts Lodge was the second Lodge chartered by the Massachusetts Grand Lodge. By Brothers John W. Krey and Sanford L. Fisher. Not long after the Lodge's 175th anniversary, man broke the sound barrier. Tonight, instead, let us hurry backwards and try to break the time barrier. As we retreat up Tremont Street, we see the year 1890 fly into the future, and there are no Boston "El" kiosks on the Common. By the time we reach the Granary Burial Ground, we are back in the early 19th century; looking to the crest of Beacon Hill, we catch a glimpse of the construction of Bulfinch's "New State House" which will have a golden dome. Receding to the year 1800 we see at the corner of School Street a sight familiar to all, regardless of the era from which one comes— King's Chapel. But all else is strange to us visitors from the year 1970, for we are now intruding even into the eighteenth century. Hurry, for the year 1770 approaches swiftly. Amidst the uncertainty of the Confederation period and the sounds of the War for Independence, we turn a few blocks down Court Street, which in 1770 was known as Queen Street, and then scurry north up Union Street. There is nothing here that we recognize any longer, for our twentieth century structures obliterated the landmarks of the era that we are visiting. But, look! There's a familiar name on that building on Union Street near Hanover "The Green Dragon" Tavern. Here let us stop our time machine, for we've gone back just over two hundred years to a significant date, May 17, 1770. Our backward journey now coasts to a gentle halt, enabling us to examine the people and events preceding the charter of our Lodge. Although there was in existence Saint John's Grand Lodge, working under a commission granted by the Grand Master of Masons in England (The "Moderns") and dated 1733, The Massachusetts Grand Lodge, corresponding to The "Ancients", was organized on December 27, 1769, "by Patent ... of the Grand Master of Masons in Scotland." It is almost gratuitous to dwell upon that illustrious gentleman who was Grand Master of the Massachusetts Grand Lodge, but his devotion to the land and people who were soon to become our nation, his belief in freedom, and his courage on the field of battle all demand that we keep his memory forever green. We refer, of course, to Joseph Warren, soldier, statesman and surgeon. Although on Friday, May 11th, his Grand Lodge had voted to defer a certain petition of the new Lodge until the 14th, The Grand Master and His Grand Wardens met on the 12th, made out and signed the charter creating The Massachusetts Lodge. On the 14th, the 13 members of the Grand Lodge met again. After some procedural questions, and with the Grand Master abstaining, they voted eight to four in favor of granting the petition. The date on the petition, however, stands as May 12th, 1770. We may now go forward in the customary flight of time and relive the evolution of our Lodge, meet some of our forbears in Freemasonry and hopefully peer across the threshold of time into the third century of this Lodge which is older than the nation itself. Stepping inside The Green Dragon Tavern we ask the proprietor to direct us to the "Masons' Arms." He eyes our strange garb and short haircuts, and he hesitates, for these are troublous times. Then, spotting a familiar emblem, he becomes cordial. "Ah yes, gentlemen, through that door and up the stairs." In the dim light we see hand-hewn timbers and planks, wooden steps already well worn by crude, heavy boots. The door at the head of the stairs is probably home-made; vertical boards "Z" braced, with wrought-iron strap-hinges. Through it is the room known as the "Masons' Arms." "To All the Fraternity of Free and Accepted Masons, to whom these Presents shall come: Joseph Warren, Esq., Grand Master; Jeremiah French, Esq., Senior Grand Warden; and Ponsonby Molesworth, Esq., Junior Grand Warden, in Boston and one hundred miles circumjacent of the same, by Patent from George, Earl of Dalhousie, Grand Master of Masons in Scotland, duly authorized and appointed, and in ample form installed, Send Greetings: "Whereas A petition has been presented to us by Joseph Tyler, William Palfrey, James Jackson, Isaac Rand, Nathaniel Cudworth, Joshua Loring and John Jeffries, all Ancient Free and Accepted Masons, resident in Boston, New England, praying that they, together with such others as may hereafter join them, may be erected and constituted a regular Lodge of Free and Accepted Masons, under the name, title and designation of THE MASSACHUSETTS LODGE . . .
".. . and require all Ancient Masons, especially those holding of this Grand Lodge and the Grand Lodge of Scotland, to acknowledge and receive them and their successors as regular constituted Free and Accepted Masons, and to treat them accordingly. JEREMY FRENCH, S. G. W.
PONSONBY MOLESWORTH, J. G. W.
That first meeting of The Massachusetts Lodge is an organization meeting: officers are elected; a committee on by-laws is appointed, and it is voted to meet on the first Monday of each month. Joseph Tyler, one of the petitioners for the new Lodge is elected Worshipful Master. During the next two hundred years he will be succeeded by 98 other Worshipful Masters, some of whom presided for only one year, another for five years (including a hiatus), and a few of whom presided on and off over a span of ten years. The present practice of each Master's having two consecutive one-year terms appears to date from some time in the 1850's. Three of these, Palfrey, Jeffries, and Jackson will succeed him. But The Massachusetts Lodge cannot wait for Worshipful Brother Jeffries to return nor for Lord Cornwallis to surrender, and so on December 9, 1778, a meeting is held at which William Palfrey, second Master of the Lodge is once again elected, and regular meetings resume. They continue regularly and then ensues a curious series of paradoxes. Freemasonry on this side of the Atlantic is becoming unified within itself, rather than through the mother Lodges of England and Scotland, and steps are initiated to elect "one Continental Grand Master". A similar move is made in the early and middle 1780's to unify all Lodges in Massachusetts under one Grand Master. At about this same time, in December of 1782, an interesting personality, Moses Michael Hays to be exact, is elected Master of The Massachusetts Lodge, and continues in that office through 1785. In 1785, while still Master of this Lodge, he is elected Junior Grand Warden of the Grand Lodge. He is described as being "indefatigable in his labors for the benefit of the Lodge." But in spite of all these good omens, The Massachusetts Lodge holds no meetings during 1776, 77 and part of '78. By this time Worshipful Hays has been elected Grand Master, and he calls a special meeting of the Lodge. The Lodge is reset on the right track and regular meetings resume. The cause of this hiatus is a subject for speculation: was it just the temper of the time—the fatigue following the war, followed by the uncertainties of the Confederation period—or had the Lodge become too dependent upon one man. No matter what the explanation, the lesson is clear: the continued success of a Lodge depends on the efforts of all the Brethren. "The Grand Lodge of Massachusetts, finding it difficult from the great increase in lodges in the Commonwealth, from their local situation, and from many other causes, to keep up correspondence with them, thought it expedient to adopt a new mode of communication; and, accordingly, on December 1801, passed a resolution dividing all the Lodges under the jurisdiction of the Grand Lodge into districts, at the same time authorizing the Grand Master to appoint a District Grand Master in and for each district, whose duty it shall be to visit the several Lodges within his district once at least in every year." "The plan of districting the State, thus first formally announced, has been continued ever since, to manifest convenience." During this period the Lodge and other local Masonic bodies have been meeting in various places, all in the same general area. They are addresses that we would know (though in some cases anti-royalist fervor have brought a change in street names). Union Street now Hanover Street, King Street, now State Street, an unnamed building opposite the north side of Faneuil Hall; the "New Masonic Hall" in The Exchange Coffee House "between Congress and Devonshire Streets near State Street"; etc., and even in the upper stories of the Old State House, shortly after the Lodge has its fiftieth anniversary. Boston is growing, both in area and population. The Back Bay has been filled with land taken from the top of Beacon Hill and from the complete leveling of the other two of the Tri-mountain which gave Tremont Street its name. New residential sections are growing in this filled land and in annexations, all to the west of the old sections, and Freemasonry keeps up with the change, moving in 1831 from its old haunts to a new Masonic Temple on Tremont Street, adjoining Saint Paul's Church. It is said that this Temple of Freemasonry gave its name to Temple Place. As we walked along Tremont Street in the latter part of the third decade of the 19th century and witnessed the construction of this Masonic Temple, our thoughts shift to the Anti-Masonic Party and the ill-will toward Freemasonry that has spread into New England from New York State. (An unexplained disappearance of one man, and mass hysteria follows; it seems to be a strangely familiar phenomenon before our mid-twentieth century eyes.) Despite the storm around their heads, the Brethren go quietly about their affairs, holding conscientiously to their belief in Freemasonry and knowing that the crisis will pass, as, indeed it does. During the twelve year period from 1829 to 1841 no addition to our membership is made, and for a while meetings are held only quarterly. There is a considerable depletion in the Charity Fund, but it survives and again prospers. In the end, probably the only people who will remember anything of the Anti-Masonic movement are the Freemasons, themselves; the movement's only contribution is not in any repression or alteration of the Order, but rather in the system of national political conventions. The middle decades of the 19th century are uneventful. Good growth is recorded, and no crises are precipitated from without or within. On various civic occasions, the Lodge is invited to participate in significant ceremonies — memorials and new municipal installations — thus illustrating the complete demise of the anti-Masonic movement. The growth of the fraternity, coupled with the offer of the National Government to purchase the Temple for judicial purposes, occasions another move. It involves a short step backward and a big stride forward, and the Temple is even nearer to the newer residential section. For this purpose the Grand Lodge acquires Winthrop House on the site of the present Temple. The building is remodeled for Masonic use and on January 16, 1860, we witness the occupancy of Freemasons' Hall. But, if the Fraternity is tranquil, not so the Nation, for within a year of this date, North Carolina will secede from the Union and on January 9, 1861, rebel shore batteries fire on the "Star of the West", an unarmed commercial steamer attempting to bring supplies to the isolated U. S. garrison at Fort Sumter. Soon the War between the States begins. Many answer the call, some as privates, some higher up the line, and one as Acting Brigadier-General, Robert Cowden, who led the first Massachusetts regiment to be federalized. The Lodge votes that "those absent (and) at the seat of battle" shall be exempted from dues paying. Strangely, the worst tragedy to strike the Lodge comes during the War, but is in no way connected with it. It is the evening of April 5, 1864- and one of the other Lodges has just closed its meeting. The superintendent's assistants are about to leave the premises when the cry comes: "Fire — Fire — Beneath the main staircase." Wood and stone are still the main building materials of the era, for the great Chicago fire and the lessons it will teach are yet seven years away, and Louis Sullivan is far too young to commence his studies of architecture at M. I. T. Winthrop House, which houses all the Masonic apartments and halls is no exception. There is no time to save anything, and many irreplaceables are consumed; furniture, regalia, paintings and documents, including the Lodge's Charter. To create even a suitable replica would seem impossible, but several details favor such an accomplishment. The Tyrian Lodge in Gloucester was chartered at about the same time as our Lodge, and its charter was signed by the same Grand Lodge Officers. Spared from the inferno, we have a record of the text of our Charter, including the names of the original members cited thereon. Finally, in Winslow Lewis Lodge there is Brother David Pulsifer, a noted antiquarian and copyist. The Tyrian Lodge agrees to lend us its charter for use as the "master"; Brother Pulsifer agrees to undertake the project. We are able to obtain a sheet of classical parchment. We have all the ingredients and now a real "master" goes to work. Very imaginative as well as a skilled technician, Brother Pulsifer constructs a gracing table of glass, illuminated from beneath. All the lines are painstakingly traced. Whn all this is finished, the parchment is submitted to a wrinkling and discoloration process – a sort of "instant aging". It is almost impossible to tell which document is a replica and which an original, right down to the signature of the Grand Master. The Grand Lodge approves, and the document is attested as the correct and proper Charter of The Massachusetts Lodge. Other paraphernalia and furniture is provided by the generosity of Brethren and friends of the Fraternity. By the spring of 1867, the construction of "The New Masonic Temple" on the site of Winthrop House is completed. As one of the constituent Lodge that will be using the new Temple, The Massachusetts Lodge is invited by the Grand Lodge to participate in the festivities marking the deciation. The occasion is marked by the presence of President Johnson (Andrew, that is) together with many of his cabinet. Preceding the dedication, there is a procession from the Common to the Temple; stores and residences are decorated in honor of the occasion. And, so, the Grand Lodge is established at its present location. In the year 1970, one hundred and three years following this event, stand, if you will, at the foot of Commonwealth Avenue and gaze at our Temple. Mentally remove all the structures that have been erected in the past one hundred years and replace them with their predecessors. The manner in which the Temple dominated that skyline is in proportion to the importance of the fraternity to the life of the community of that era. You may thus understand why that dedication was such a gala affair for the city. On the September 16th following this event, the Lodge has its first meeting in the new Temple with yet another festive occasion on its horizon. Through wars and fires, through anti-Masonic movements and recovery, through growth of the city, state and Freemasonry, one hundred years pass from that Saturday in colonial times when Most Worshipful Joseph Warren and his two Grand Wardens signed our Charter. On May 12, 1870, The Massachusetts Lodge observed its first centennial anniversary with proper ceremony and reverence. The booklet commemorating the event contains an historical sketch, the By-Laws, and biographical sketches of prominent early Brethren; it is a collector's item. The historical sketch ends with the thought: "Thus shall those who follow us speak reverently of the past, while looking hopefully to the future." The Lodge lias over two hundred members, and no debts and a future of fraternity and charity. In all living organisms, there are three phases. Shakespeare poetically describes the seven ages of man, but more simply and distinctly, we may delineate three: youth, manhood and age. The first is always one of great, great growth, change and activity. For most of us the many years of manhood are characterized by stability, with few departures from the norm. The first centennial celebration of our Lodge must certainly mark the end of its youth. Now come the years of stability. There is continued, steady growth despite severe depressions in the '70's and '80's. As the nineteenth century draws to a close, it has one final memento to bestow at "51 Boylston Street" — another fire. Although the damage to the building is such that it must be evacuated and a new Temple built, much of the paraphernalia and records appear to have been spared. During the next four years, the Lodge seeks temporary quarters in three different locations. On September 18, 1899, meetings are again held in the Temple on the corner of Tremont and Boylston Streets. Entering the twentieth century, The Massachusetts Lodge is about at the peak of its growth; it will continue on this plateau for some time. But the nation, which is younger, is still growing. In 1778, the year in which The Massachusetts Lodge resumed its meetings after the War for Independence, Captain Cook discovered the Hawaiian Islands. Now, in 1901, these islands are annexed by the United States. Just as the spread of settlements in Massachusetts begot a growth of The Grand Lodge of Massachusetts, so the annexation of these islands feeds the growth of Freemasonry across the Pacific Ocean. Indeed, no Brother who tours these Islands should fail to visit the Masonic Temple on Oahu — one of the most beautiful anywhere. The theme of this dissertation is that "The soul of history is the history of great men." In choosing this theme, the Reverend and Worshipful Brother Chase again emphasizes the middle-age stability of The Massachusetts Lodge. Herbert Hoover, when he was chairman of a committee to study recent economic changes, summed up the findings: "The key to understanding recent changes lies in recognizing that they are changes in rate." Acceleration. And so it is for the twentieth century — very rapid changes accompanied often by turmoil. In the midst of upheaval. Freemasonry, with its stability and its conventions, likened even to the times of King Solomon, provides something that is permanent, a "peaceful harbor", an atmosphere of Brotherhood in an era of strife. The President of M. I. T. has said that his Institute should not be a conservator of the past. So while still cherishing what is beautiful and teaching its doctrine of morality and brotherly love in its work, Freemasonry must do more than perpetuate by rote its beautiful ritual or practice its pageantry. There are broader avenues of service to one's fellow men. It seems that the end of a war and a major anniversary of the Lodge are frequently consecutive. The first centennial celebration followed soon after the War between the States; the one hundred and fiftieth anniversary followed World War I. The 175th anniversary is a bit out of phase, preceding as it does VE Day. (1954 Mass. 158-173) This anniversary, therefore, is observed while we still have brethren serving in the Armed Forces. The total membership on this occasion is 247, with twelve of them serving with the Armed Forces. However, while the average age of membership in The Massachusetts Lodge has risen since World War II and the migration to the suburbs of the younger generation and the foundation of new Lodges in those places has had the effect of reducing the size of The Massachusetts Lodge and the age of individual members has risen, the influence of Masonry and the amount of activity in these Lodges has widened the good influence and effectiveness of Masonic work. The membership of our Lodge has always included the effective membership of greater Boston population — many of different national backgrounds and religions have knelt at the same altar and offered the same prayers of brotherly love for the strength and well-being of the fraternity. MASSACHUSETTS GRAND LODGE, Organized December 27, 1769, by authority of a Commission from Right Honorable and Most Worshipful George Earl of Dalhousie, Grand Master of Masons in Scotland, bearing date of March 30, 1769, appointed the Most Worshipful Joseph Warren, Esq. to be Provincial Grand Master of Masons in Boston, New England, and within One hundred Miles of the same. MARCH 5, 1792, St. John's Grand Lodge and Massachusetts Grand Lodge united into the present Grand Lodge. Friday, MAY 11 1770, Eight members of St. Andrew's Lodge, Brothers Joseph Tyler, William Palfrey, James Jackson, Isaac Rand, John Hill, Nathaniel Cudworth, Joshua Loring and John Jeffries, petitioned the Massachusetts Grand Lodge to be erected into a new Lodge to be held in Boston under the title of The Massachusetts Lodge". Saturday May 12,1770, The petition was granted the Lodge INSTITUTED and the Charter signed by Joseph Warren, Grand Master; Jeremy French, S. G. Warden; Ponsonby Molesworth, J. G. Warden. Brothers Palfrey, Hill and Jeffries were appointed a committee to form By-Laws. The first Monday of each month was the time set for the regular meetings. Friday AUGUST 10 1770, At a communication of the Massachusetts Grand Lodge in Concert Hall the Lodge was Constituted and Brother Joseph Tyler was installed by Joseph Warren Grand Master, and proclaimed Right Worshipful Brother Joseph Tyler, Master of The Massachusetts Lodge " The Grand Secretary was ordered to make a record of that proceeding, after which the remaining officers were installed. For the history of the first 200 years, please refer to page 223 of the 1970 Proceedings of Grand Lodge. For the history of the first 175 years, please refer to page 158 of the 1945 Proceedings of Grand Lodge. For the history of the first 150 years, please refer to page 141 of the 1920 Proceedings of Grand Lodge. Wor. Steve John Gogolos, Historian. The first 200 years (1770-1970) of the history of THE MASSACHUSETTS LODGE have been well recorded in the records of the Lodge and are also to found in the ARCHIVES of the GRAND LODGE. As we celebrate our 225th year it is time to record the ensuing twenty-five years (1970-1995). Our history during these years was interwoven with national and world events We suffered through the turmoil and aftereffects of the Vietnam War. We endured the energy crises, the high interest rates, the sluggish economy, and hostage crisis of the 1970's During the next fifteen years we faced a recession and the invasion of Grenada, witnessed the fall of the Soviet Union and fought the Gulf War. Our Lodge and all of Masonry experienced lean years in terms of membership and participation The reasons were many the national and world events; a transient society burdened with domestic and job-related demands; retirements to warmer climates; an aging membership; and a dearth of young candidates. It was during these years that the leadership of the Lodge fell on the shoulders of a few dedicated good men. From 1970 to 1995 a total often Masters served, with one Master serving an unprecedented six years. The retirement of our stalwart Treasurer, Wor. Eugene H. Clapp II, took place and our devoted Secretary Bro. G. Frank Pierce Not long after, we lost our beloved Chaplain, Bro. Sanford L. Fisher All these departures had to be addressed by the remaining officers and members of the Lodge. In the year 1971, Wor George John Avis was completing his second term as Master of The Massachusetts Lodge. He would go on to serve four more years (1979, 1981, 1985, 1986). Wor. John W Krey served in 1972 and 1975 Strong bonds were cemented by this group of officers who still continue to meet annually. Wor. Menelaos C Dalaklis served in 1974, 1975, and again in 1978. In 1976 and 1977, Wor. John G. Cosmas served as Master. In 1980, Wor. Eugene H. Clapp II again answered the call, even though he had served in 1951 and 1952. He was followed by Wor. George John Avis in 1981. During the next three years (1982-1984) Wor. S. Arthur Verenis assisted in guiding the Lodge during those turbulent years. He had previously served as Master in 1959 and had the distinction of being the first member of Hellenic descent to be elected Master of the Lodge. In 1985 and 1986, Wor. George John Avis returned to serve the Lodge. He was followed by Wor. Steve John Gogolos who served during the years of 1987 and 1988. Next to serve was Wor. Nicholas Darris (1989, 1990, 1991) followed by Wor. Argyrios A. Karalis (1992, 1993). In 1994, Wor. David F. Howard was elected to lead the Lodge He was elected again in 1995 and he continues to serve with vitality and humility - a popular and well-liked officer who traveled with the District Deputy Grand Masters, Rt. Wor. Clark B. Loth and Rt. Wor. Homer M Shellenberger throughout the (Boston) First Masonic District. In 1989, The Grand Lodge of Massachusetts appointed Wor. George John Avis the District Deputy Grand Master of the (Boston) First Masonic District. Under his leadership, the Constituent Lodges formed a warm bond and it was manifested in large suites at Fraternal and Official Visitation so popular was this representative of the Grand Master, that a District party was organized and well amended by all of the lodges in and around the Boston District. Rt. Wor. George John Avis has since departed to the warm climate of Arizona. We wish him a long and healthy retirement. Another member who affiliated with The Massachusetts Lodge, was Rt. Wor. Stephen Kaloyanides. Stephen is a Past Master of Victory located in Watertown, where he served as District Deputy Grand Mater of the Waltham Fifth Masonic District. Under his leadership and guidance, the officers realized their full potential. As the leader of the Degree Team of the Hellenic Square and Compass Club, he has personally supervised the Installation of the Officers of this Lodge and assisted in raising many candidates throughout Massachusetts. In 1987 and 1988, The Massachusetts Lodge led the way in becoming one of the first Lodges in the Boston First Masonic District to donate to the DeMolay Order. Over the years the Lodge has faithfully donated annually to the Masonic Home in Charlton Additional recent donations have been to the Shriners Burns Hospital, the DARE Program, The Samuel Crocker Lawrence Library, the Scottish Rite Foundation for Learning; Disabilities, the Grand Lodge Education Fund, Massachusetts DeMolay, The Trowel Magazine, The Northern Light Magazine, The Museum of Our National Heritage, and The George Washington National Monument. I would like to say Thank You to Rt. Wor. George Avis for helping us begin the 201st year. To all those before and after for guiding the destiny of our Lodge and to Wor. David F Howard for helping us reach the 225th year of The Massachusetts Lodge. I am confident that this Lodge and its officers will continue to excel in their ritual and in the hospitality accorded its members and its many visitors and guests. The 21st Century is here and we should and will continue to move toward our next milestone, the 250th Anniversary of The Massachusetts Lodge. To borrow a thought from the historical sketch of the 1870 Centennial Anniversary Book "Thus shall those who flow us speak reverently of the past, while looking hopefully to the future." During the past twenty-five years, The Massachusetts Lodge has maintained a good rapport with its members, both here and across the nation. The generosity of the brethren and friends of the Fraternity had much to do in keeping The Massachusetts Lodge moving and arriving at the twenty-first century. In closing I want to thank all the officers who assisted me in putting together this brief history of our Lodge, more particularly Rt. Wor. Stephen Kaloyanides and the holder of a 50-year Medal, Bro. Peter N. Stamas. I would also like to thank all the members of this committee who shared their thoughts and helped formulate the 225th Anniversary celebration. H. L. Burrell, M. D.
There are many others who worked behind the scenes in Grand Lodge business and operations. Massachusetts Lodge, christened by the name of a good old State, we find in its lectures and work many good old fashions, and among its members many good old friends. We do not wonder at its being prosperous and flourishing, for it has had the advantage of counsels and examples of many worthy good Masters, among which they have been instructed by the traditions of Moses, the patience of Job, the love and affection of John and Jonathan, the interpretations of Daniel, the prophecy of Zachariah, the valor of Michael, the purity of Enoch, and last, though not least, by the faithfulness of Abraham. The Brethren whose names and merits arc so skilfully interwoven in the above sentiment were all Past Masters of Massachusetts Lodge. Moses M. Hays was one of the most zealous Masons who ever filled the position of Grand Master. Job Drew is remembered by a few of the older Brethren now living as very proficient in the lectures. John Boyle was the first District Deputy Grand Master of the First District. Jonathan Whitney and Daniel L. Gibbens were honored for many years in the active service of the Lodge. Zachariah G. Whitman was the first historian of the Lodge. Michael Roulstone was active in the State militia, in which he held a prominent position. Enoch Hobart was esteemed by all for his purity of life and conduct, and has left a pleasant memory from his zeal in building up the Charity Fund of the Lodge. Abraham Annis Dame is the only survivor of this group of distinguished Brethren, having been a member of the Lodge fifty-eight years, and until within a short time has been an active member, and regular in his attendance. This is one of the three Lodges in this Commonwealth whose Charters bear the name of Gen. Joseph Warren as G. Master, it having been organized in 1770, and during the administration of that lamented Brother as the presiding officer of the "Massachusetts Grand Lodge," so called, in contradistinction to the "St. John's Grand Lodge." It has always maintained a highly respectable position among the Lodges in the Commonwealth, and its roll, past and present, bears the names of many of the most honored and substantial of our Brethren. Relying perhaps too much on its well-earned laurels, it has not always kept even-pace with the rapid progress of its more youthful associates. A new spirit, however, has within a few years past been infused into it, and now, with a membership numbering more than one hundred, including a fair proportion of young, talented and ambitious Brethren, it may be classed among the most active and promising of our Lodges, as it has always been among the most respected. Having recently elected a new set of officers, and with a view of allowing the families and female friends of the members an opportunity to examine the elegant apartments now occupied by the Fraternity in the city, a public installation was decided on, and came off on the evening of the 21st January, ultimo. The large hall was literally crowded with spectators, there being at least six hundred present, many of whom were obliged to stand during the entire ceremonies. It was a jam, — which ought not to have been the case, — and the effect was to detract from the pleasure and enjoyment of many. ODE, By Bro. Edward S. Rand, Jr. In love let our bosoms expand. Who will still be our friend to the last. In Charity free towards all. A blessing descends on us here. 'Neath the bright rays of friendship and love. To the Lodge of oar Master on high. The address of the evening was delivered by Rev. Bro. Wm. R. Alger, of this city, and like all the productions of that eloquent Brother, was a chaste and beautiful performance. It was delivered without notes, and we judge was chiefly extemporary. But however this may be, it was a finished and eloquent production, and very rarely indeed have we witnessed the attention of any public audience more intensely fixed on the words of the speaker. At the conclusion of the address, the W. Master, Brother Thos. G. Wytal, extended an invitation to the ladies and all others present to examine the various apartments of the building. And thus ended one of the many pleasant reunions of the season. Ninety-four years ago, May 12th, 1770, and of Masonry 5770, Joseph Warren, Esq., Grand Master in Boston, and within one hundred miles circumjacent to the same, by Patent from George, Earl of Dalhousie, Grand Master of Masons in Scotland, duly authorized and appointed, did, on that date, sign the Charter whereby the precedence of Massachusetts Lodge was declared to date from these Presents, in the Grand Lodge, and elsewhere; and since that time this Lodge has been in possession of its Charter. It has had periods of reverses, when no initiates have entered its portals for years, but has always had members attached to its ancient Charter, who, in preserving lhat, have preserved an unbroken history. It was therefore with no ordinary feelings of pleasure, that the members determined to celebrate the 95th anniversary in a manner to admit the ladies, as participants in the festivities of the occasion, and to witness the present prosperity of the Lodge. The Exercises were as follows:— Music. Prayer. Ode. Address, by the W. M., Br. Alfred F. Chapman. Music. Reading of Charter of Lodge, by W. Br. A. A. Dame. Ode. Historical Address, by Br. C. W. Slack. Original Poem, by Rev. Br. W. S. Studley. Banquet. Of the literary portion, it is enough to say, that the Hisiorical Address, by Br. Slack, was highly interesting and instructive. The Poem— Like the star that athwart gilds the sky, Its course to the latest was bright. Among the guests were William Parkman, Esq., Grand Master, and lady; C. C. Dame, D. G. Master; J. McClellan, G. Treasurer, and lady; Solon Thornton, Grand High Priest, and lady, together with others, and a full attendance of the members of the Lodge, and their ladies. Prominent among the members was Matthew S. Parker, Esq., admitted to membership in 1803; Enoch Hobart, in 1817; A. A. Dame, in 1818, and Wm. Palfrey, in 1819, whose son, recently admitted to membership, makes the fourth generation of this name to become members of the Lodge; and Henry Bowen, admitted in 1820. At twenty minutes past ten o'clock, the W. Master, accompanied by the G. Master and members above named, preceded the procession to the large Hall, where was spread a sumptuous and bountiful table by the Superintendent, Br, L. L. Tarbell. The exclamation of the Grand Master on entering the banqueting hall—"this is beautiful," will give the best impression of the same. It was a table of beautiful wares, laden with delicacies, and perfumed with the breath of flowers, gathered into twelve fragrant bouquets, which, later in the evening, were disposed of to as many ladies, who happened to hold a talisman given by chance on entering the hall. Speeches were made by Grand Master Parkman, Rev. J. W. Dadmun, Rev. Dr. Walker, and Rev. Br. Studley, eloquent and humorous, and highly appropriate, if we may judge from the open and frequent expressions of pleasure too great to be repressed, for every now and then one and another would persist in declaring it ; so that in closing, the sociability and good wishes provoked by the occasion, had prepared all who could, to join in singing " Auld Lang Syne," with spirit and feeling, and inspired the "good night," that came from every lip, with, the spirit of peace on earth and good will to men, and God's blessing on Massachusetts Lodge and its members. The occurrence of the Centennial Anniversary of a Masonic Lodge, wherever located, or under whatever circumstances, is an event eminently worthy of commemoration. The full rounding off of one one hundred years of continued existence, is a favor which few voluntary secular associations are permitted to realize. Bound together by no special ties of interest, such societies spring into life, play their allotted part, pass away, and are forgotten. To this general law of mutation, Masonic Lodges, though by no means wholly or even largely exempted, undoubtedly present more exceptions than are to be found in any other class of the community. This may, and probably is, in some measure, attributable to the fact that the Masonic Fraternity, as a secular institution, is more numerous, both in its membership and in its auxiliary aids, than any of the other social divisions. But the true reason is to be found in its peculiar conformation, and adaptation to the social needs and necessities of life. In this respect it is without an equal. Its members, whatever may have been their motive in joining it, soon learn to love it, not from selfish or eleemosynary considerations, but from the harmonizing and softening influences which it exercises over their lives, the sympathetic emotions it awakens in the heart, and the confidence it inspires in each other. And this is the secret of its success and endurance, that which has brought it down along the ages of the past, and will carry it forward in defiance of the prejudices, the opposition, and the persecutions of bigotry and intolerance, for ages to come. Sutton or Corinthian Hall, where the afternoon exercises were held, was well filled by the members of the Lodge with their ladies and friends. A voluntary on the organ was the opening, after which the M.W. Grand Master and suite were received in Due Form. Music by the choir followed this ceremony, after which, W.M. George Emerson made an address, extending a cordial welcome to the company present, saying that the occasion was one from whicli they could look back with pride and satisfaction. "While the zeal of our ancestors is brought before our minds, a fresh impulse and a new zeal is obtained in the endeavor to discharge every duty which devolves upon us as members of this honorable Lodge." In 1770, Boston was a town of 20,000 inhabitants; 4000 houses, mainly of wood. Hancock's house, finished in 1737, was the most elegant structure in town. Mr. Slack now recited various historical events that took place during the period prior to the Revolutionary War, in the midst of which the Lodge was chartered. May 12, 1770, Joseph Warren placed his name to the Charter for the institution of the Lodge; Joseph Tyler, James Jackson, Isaac Rand, William Palfrey, John Hill, Nathaniel Cudworth, Joshua Loring, and John Jeffries, with Joseph Warren as Grand Master, he being then twenty-nine years of age, constituted Massachusetts Lodge, May 12, 1770. In December, of the same year, he was installed Grand Master of Masonry in Boston, and within one hundred miles circumjacent of the same. Masonry was regularly introduced into Boston about one century after the settlement of the country. In 1764, the Masons' Hall was in the Green Dragon Tavern, on Union Street. In 1768, the Royal Arch Lodge of Masons was organized. The first meeting of the Lodge was held in the old hostelry. The second meeting was held in the same place, when it was voted to hold future meetings at Concord Hall, on Queen, now Court Street. On the 3d of January, 1774, the M.W.G.M Joseph Warren visited the Lodge in Due Form, receiving the full honors of Masonry — his last official and personal visit. From October, 1774, to February, 1775, the Lodge met in the Bunch of Grapes Tavern. A suspension then occurred, the Lodge holding its next meeting on December 9, 1778. On the 7th of March, 1780, k made a movement for the union of all the Lodges in the country, and it culminated in the union of the Massachusetts and St. John's Lodges. During the years 1783-5, Moses M. Hays was the Grand Master. The announcement, on the evening of the 2d of November, that the Charter was missing, created great excitement; no trace of it could be found; but, on the 2d of December, it again hung in its accustomed place. On the 30th of April, 1810, the propriety and utility of instituting a fund for charity was suggested. A committee was appointed to consider and report a plan, which was adopted July 30. 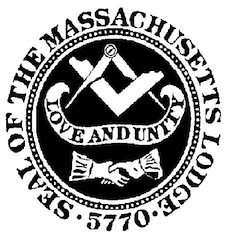 On the 16th of June, 1817, an act of incorporation was obtained from the Legislature of Massachusetts for the Grand Lodge. In 1817, the several Lodges procured a lease of apartments in the Exchange Coffee House. The premises were destroyed by fire, November 3, 1818, the Lodge losing much of its regalia. The present arrangements, respecting charity to strangers, were established in 1819. In the spring of 1821, the Lodge took apartments in the upper story of the Old State House, the hall possessing ample accommodations. On the 29th of March, 1822, a portrait of Most Worshipful Joseph Warren was obtained. June 17, 1825, the Lodge participated in the ceremonies of laying the corner-stone of Bunker Hill Monument. February 23, 1827, the Lodge took action on the subject of erecting a Masonic Temple. On the 30th of December, 1831, the Lodge met for the first time in the new Temple on Tremont Street. On the 24th of June, 1845, upon invitation of King Solomon's Lodge, of Charlestown, the Lodge joined in publicly dedicating the model of the old monument erected by them, in 1794, to the memory of General Joseph Warren. On the 11th of November, the Lodge participated in the dedication of the new Masonic Hall in the old Temple. On the 15th of November, 1858, the Lodge met in Nassau Hall, on Washington Street, and on the 10th oi January, 1860, in the Winthrop House. On the 5th of April, 1864, this was destroyed by fire, and the Lodge again lost its property, and took temporary quarters in Thorndike Hall. On the 14th of October, 1864, the corner-stone of the present Temple was laid, and the dedication took place on St. John's Day, June 24, 1867. The first meeting of the Lodge was held the 24th of September following, making the seventeenth place of communication it has known. On this its one hundredth anniversary, it stands the third oldest Lodge in the State, but second to none for its strict observance of those masonic virtues — Friendship, Morality, and Brotherly Love. At the close of Br. Slack's address, an address was made by the M.W. Grand Master, William Sewall Gardner, and this closed the exercises of the afternoon. At half-past six a reception was held, when the Committee received their many prominent guests; at half-past seven the company passed up stairs to the banquet, which was served in the banquet-hall of the Temple. Floral decorations were abundant, giving the hall a beautiful appearance. Opposite the entrance and against the wall were suspended "G" and the square and compass, formed of red and white pinks, set in roses relieved by smilax. On one side of the hall was " 1870," and opposite, "1770." Large baskets of flowers hung from the arches of the Gothic windows and over the various arches which divide the hall. The tables were spread by William Tufts, caterer, and presented a tempting appearance, all that was necessary for such an occasion being provided in abundance. The Germania Band occupied the entry adjoining the hall, and discoursed those selections which have made the band so famous for receptions. When the banquet had been partaken of, the W. M. George B,. Emerson called the company to order, and introduced M.W. Grand Master William Sewall Gardner, who excused himself from making a speech, and called upon Charles Levi Woodbury, who interested the audience, in his humorous manner, by anticipating that Masonry in the future might be composed of women. Mayor Shurtleff was the next speaker, congratulating the Lodge on the success of their first centennial. Br. Slack closed with an address. The company now passed to the Gothic Hall, where the Boston Commandery choir gave a musical entertainment. In the mean time the banquet-hall was cleared of its tables, and soon the feet were busy keeping time to the music of the Germania Band in a well-selected order of dances. This was continued until 12 o'clock, when the festivities of the day were ended. The affair was a complete success in the full sense of the word. The Committee of Arrangements, Messrs. Henry J. Parker, Alexander K. Bryer, Edwin Wright, Charles W. Slack, Samuel W. Creech, jr., George R. Emerson, Samuel A. B. Bragg, have been indefatigable in their efforts to make it so, and were last night rewarded by feeling satisfied that the Centennial Anniversary had been observed in a manner which reflects credit upon the Lodge and the Fraternity. At the 107th annual meeting of Massachusetts Lodge, held on Monday evening, December 17, the following officers were reelected for the ensuing year: Worshipful Master, Samuel W. Creech, Jr.; Senior Warden, Edwin Wright; Junior Warden, George P. Eustis; Treasurer, Charles K. Darling; Secretary, Charles O. Fox; Senior Deacon, Eugene H. Ingalls; Junior Deacon, Cassius C. Powers; Chaplain, Rev. Samuel Kelley; Senior Steward, George H. Towle; Junior Steward, Charles F. Sanborn; Marshal, Aaron F. Nettleton; Inside Sentinel, Jacob Kolb; Organist, John B. Rhodes; Tyler, Henry Orr; Trustees of Charity Fund, Abraham A. Dame, Randall G. Burrell, Alexander K. Bryer, Charles W. Slack, George R. Emerson, The officers were installed in an able and impressive manner by R. W. Henry G. Fay, D. D. G. M. of 1st Masonic District, assisted by Bro. Robert C. Nichols as Marshal. Massachusetts Lodge, Boston, was visited on Monday evening, January 21, by the M. W. Grand Master Charles A. Welch and suite, including W. Bro. H. G. Fay, D. D. Grand Master. The Grand Master was received and welcomed by Worshipful Master S. W. Creech, who also welcomed the Brethren composing the delegation. The Worshipful Masters' Association, of the First Masonic District, also attended, the Grand Master, and the entire occasion was one of pleasure. During the evening the First Degree was worked in a very creditable manner, the only son of Past Master Burrell being one of the two candidates. The Grand Master made some very happy and encouraging remarks at the close of the work, and manifested a lively and intelligent interest in the welfare of the Craft over whom he presides. The officers of this old Lodge appeared in an entire new suit of aprons and metal collars, given to the Lodge by the united efforts of some of its members. Massachusetts Lodge celebrated its One Hundred and Tenth Anniversary in the Masonic Temple, in Boston, on May 17th last. A very pleasing, musical and literary programme was arranged and successfully carried out. Wor. Bro. Edwin Wright, Master, presided, and gave an historical address. Brief addresses were also made by M. W. Grand Master Welch, and by W. Bro. William Babson, Master of Tyrian Lodge, in Gloucester, Mass. The Massachusetts and Tyrian Lodges were chartered by Joseph Warren in the same year, the latter being but a little the older of the two. In closing, W. Bro. Babson gave the following sentiment: "Massachusetts and Tyrian Lodges, born amid the throes of the Revolutionary Kpoch, by their teachings they inspired the patriots' hearts, and taught them that to die for the right was immortal gain. Now their lines are fallen in pleasanter places. Side by side may they pass on in prosperity and peace, through unending ages." Since its organization to the dale of the celebration, Massachusetts Lodge had held 1400 meetings, and brethren familiar with such occasions can understand how great has b-en the trust reposed in it, and how arduous must have been its duties. The one hundred and eighteenth annual communication of Massachusetts Lodge, F. and A. M., was held on the evening of December 17th, in the Masonic Temple., The following officers were elected and subsequently installed by Worshipful Brother William G. Whitney, one of the Past Masters; Chas. D. Wright, Worshipful Master; Henry M. Greenough, Senior Warden; John F. Neill, Junior Warden; Chas. O. Fox, Secretary; Eugene H. Clapp, Treasurer; S. A. B. Bragg, Chaplain; W. L. Willey, Senior Deacon; Dr. Heber Bishop, Junior Deacon; H. Prader, Senior Steward; A. W. Clapp, Marshal; William H. Gerrish, Organist; J. F. Sampson, Tyler. This Lodge was chartered by Joseph Warren, and wears its honors worthily. The annual meeting of Massachusetts Lodge, Boston, was held in Masonic Temple, December 17th. The following officers were elected: Worshipful Master Edward N. West; Senior Warden, John R. Griffin; Junior Warden, William W. Chute, Treasurer, Arthur W. Clapp; Secretary, James C. Bates; Senior Deacon, Henry Townsend; Trustee for one year, Thomas E. Sharpe; Trustee for three years, John McGaw. Appointments were: Chaplain, Rev. Edward Abbott Chase of Wollaston; Marshal, Charles E. Kingsbury; Senior Steward, Charles W. Annable; Junior Steward, Elmer Orlando Weld; Inside Sentinel, Howard A. Benedict; Tyler, Fred Sampson; Organist, William H. Gerrish. The officers-elect were installed by Henry H. Kendall, Past Master of Massachusetts Lodge, assisted by Past Master Charles A. Neill, also of the same lodge. Following the work, Chaplain Chase presented to the new Master a costly ivory and gold gavel, suitably inscribed the gift of several members of the lodge. Mr. West is one of the youngest masters of a Masonic body in the city. Most Worshipful J. Albert Blake, Grand Master, paid a fraternal visit to the Massachusetts Lodge. Boston, Monday, March 16. The Grand Master was accompanied by a number of his grand officers and other distinguished brethren. The visit of the Grand Master was anticipated by Worshipful Master Edward N. West and he made it an occasion of marked importance by bringing together the past masters of sister lodges and many other Masons of note to meet the Grand Master. Previous t0 the reception of the guests on motion of Senior Warden John R. Griffin it was voted to send a box of roses to Rt. Worshipful Leon M. Abbott, District Deputy Grand Master of the district, and a set of resolutions deploring the unfortunate accident that befell him a few weeks ago. The social features of the evening were promoted by a banquet at which about 400 had seats and by vocal music. Speeches were made by the Grand Master and others. The evening was one of pleasure to all who were present. Sociability and Fraternal courtesies between lodges and the brethren of lodges in New England have never been so noticeable as at the present time and it is almost impossible to keep up with the social news event of the Masonic bodies in the vicinity of Boston. The Massachusetts Lodge, Boston gave an entertainment in Masonic Temple, May 21st, for the purpose of raising funds for the furnishing of the new Masonic Home at Charlton. The enterprise was inspired by the ladies who under the leadership of Mrs. Everett C. Benton are engaged throughout the State in the movement to furnish the Masonic Home with a library and other articles of furniture. The evening was graced by the attendance of Grand Master Dana J. Flanders and all the apartments of the Temple were thrown open for the inspection of the guests of the evening. John R. Griffin, Master of Massachusetts Lodge, welcomed the head of the craft in the State. Grand Master Flanders was invited to deliver an address, and said he was delighted to Snd that the ladies had taken such interest in the Masonic home as to assist it. The building has been purchased, and what the promoters desired was to have a substantial endowment fund. There had been subscribed $100,000, or half what was deemed necessary. If the women furnished it, as seemed likely now, he had no doubt that the committee would be able before the close of the year to open the institution for the reception of some of those Masons who had no home of their own. "The Massachusetts Lodge," the third oldest lodge meeting in Masonic Temple, Boston, and the second lodge chartered by the Massachusetts Grand Lodge, held a public installation and Ladies night, Monday, Jan. 18. It was the first occasion of the kind held by the lodge in 15 years and was a pronounced success in every aspect. More than 300 were in attendance. The program opened with a reception by Wor. Master James G. Brown and Mrs. Brown; Senior Warden Arthur N. Dodge and Mrs. Dodge; Junior Warden Frank A. Rice and Mrs. Rice. The reception was followed by a banquet in the banquet hall which had been beautifully decorated for the occasion. There was a myriad of electric lights, Mowers and flags. Each table was decorated with large baskets of flowers. The effect was delightful and inspiring. In the main hall the order of exercises included reception of District Deputy Grand Master David T. Montague with his marshal, Wor. Leonard G. Roberts; Reception of Most Worshipful Grand Master Melvin M. Johnson, who was attended by Deputy Grand Master Frederick W. Hamilton, Senior Grand Warden George C. Thacher, Acting Grand Sec. Frank Vogel and Grand Marshal William M. Farrington. The head of the craft presented the regards and compliments of Grand Lodge on his first fraternal visit to the lodge. Other guests were: W. F. W. Taber, WM, and Frederick S. Fogg, PM of St. John's Lodge; Howard M. Fletcher, WM of Columbian Lodge; Charles Thomann, WM, of Germania Lodge; Francis M. Ryder, WM, and John P. Feehan, PM of Joseph Warren Lodge; William A. Rodday, WM of Joseph Webb Lodge; Arthur A. Sondheim, WM of Shawmut Lodge; Joseph T. Paul, PM of Mt. Lebanon Lodge, and Henry S. Dunn, PM of Aberdour Lodge. There was a reception to the colors, "Star Spangled Banner" being sung as Past Master Whitney entered with the American flag and Richard T. Lombard with the State emblem. The installation of the officers of the lodge was by Senior Grand Warden George G. Thacher assisted by Wor. Brother Edward C. Reynolds as Marshal, each of whom, at the end of their service, was presented a fountain pen by the Worshipful Master as a souvenir of the occasion. Dancing concluded the exercises of an evening that was pronounced a complete succes in every feature. The officers of the lodge are James G. Brown, Master; Arthur N. Dodge, Senior Warden; Frank A. Rice, Junior Warden; Eugene H. Clapp, Treasurer; James C. Bates, Secretary; Rev. Edward Abbott Chase and Rev. Charles E. Eaton, Chaplains; Richard M. Pearce, Marshal; William A. Syer and John M. Finch, Deacons; Wilson G. Cotton and James A. Holt, Stewards; Guy W. Jones, Inside Sentinel, Wm. H. Gerrish, Organist and Edward F. Jacobs, Tyler. The company was provided with a handsome souvenir program. The general committee consisted of Worshipful Master Brown, Past Masters Reynolds and Eastman, Arthur N. Dodge, Frank A. Rice, Richard M. Pearce, Henry Townsend, Westly J. Merrill and John J. Richards; the banquet was in charge of Past Master Reynolds, while the music was in the hands of Westly J. Merrill, and Arthur N. Dodge attended to the decorations. Civil War Veterans — William G. Whitney, Rupert J. Chute and Eugene D. Sanborn. Spanish War — Ralph W. Clogston, Albert M. Johnson and Frank S. Shiverick. World War — Frank G. Anderson, Stanley T. Andrews, G. H. Arcliilles. John T. Archilles, J. W. Barnes, Myron B. Barstow, A. A. Bibeau, Henry Abbot Brown, Einar W. Chester, E. L. Corson, Paul S. Crooker, Roland D. Crook, Henry L. Cross, C. J. Cullington, George P. Cummings, Howard G. Davis, Roy Feiser, H. C. Friese. Carl Leon Fleming, Lorimer E, Goodwin, W. E. Guest, John P. Hanlon, G. E. Harris, W. A. Humphreys, Clarence E. Johnson, S. E. E. King, William W. Mclnness, Fred Young Marshall, Frank Arthur Moore, Edward H. Oakley, Robert C. Peterson, W. W. Phipps, E. E. Randall, George Riddler. Jr.. Frank E. Rust, Frank H. Schooler, Fred M. Sears, Benjamin S. Sharp, William F. Sinclair, W. G. Smith, Ward P. Snow, Chester H. Thompson, George E. Tufts, Leland L. Tuttle, Lawrence M. Tuttle, Thomas G. Ward, N. W. Whittemore. Singing of war songs led by Past Master Frank A. Rice, with Fast Master W. W. Chute at the piano was a feature of the exercises. A tribute to the late Loren R. Smart, a veteran, was paid at the close. A draped vacant chair at the head table was flanked by a floral square and compass. While the company stood at attention the Vacant Chair was sung by Charles H. Bennett, baritone. A guest of the lodge was Adjutant General Jesse F. Stevens. This page was last modified on 5 June 2018, at 14:28. This page has been accessed 65,874 times.